Do more in a smaller space. The ultra-compact Samsung CLX-3185FW color laser MFP prints, copies, scans and faxes at a professional level, without requiring a desk of its own. The footprint measures just 14.9" x 13.5", and it connects quickly and securely to your wireless network with just the push of a button. Connect quickly and securely to your wireless network with the touch of a button, via the CLX-3185FWs Wi-Fi Protected Setup (WPS). Simply select WPS on your WPS-supporting router, then press the One Touch WPS button on your CLX-3185FW. 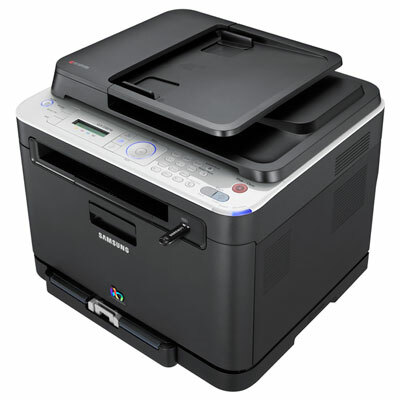 Now you can print, copy, scan and fax with convenience, ease and speed with the ultra-versatile CLX-3185FW. The intuitive control panel and blue compass navigation on this printer make it easy to navigate menus and perform different functions. Samsungs innovative polymerized toner delivers outstanding print quality. The toner particles are smaller and more uniform, resulting in crisp lines and more subtly blended tones. Samsungs polyermerized toner process involves a wax layer and fine fusing, which protects printouts against folds and smudges, while reducing paper curl and jams. That means less waste and less downtime. This highly efficient process also results in lower power consumption. Samsung is committed to creating more efficient, more environmentally conscious technologies. From manufacturing to shipping, to the way your product operates, were always looking for a better way of doing things.